THE LABOUR RELATIONS Commission has intervened in a dispute between Aer Lingus and staff represented by IMPACT over plans to close a cabin crew base at Shannon Airport, which employs 87 people. Director of Conciliation Services Kevin Foley has requested that both parties meet him this Friday to discuss the dispute and try to come to an agreement. Speaking to TheJournal.ie, Foley said that “both parties have indicated they are prepared to meet with the commission on Friday”. He stressed that the meeting called is specifically to do with the dispute in Shannon and not yesterday’s ballot. Yesterday, trade union IMPACT announced its ballot of cabin crew resulted in a 91 per cent vote in favour of industrial action, up to and including strike. The union said the dispute centres around roster issues and breaches of agreements previously made through negotiations. 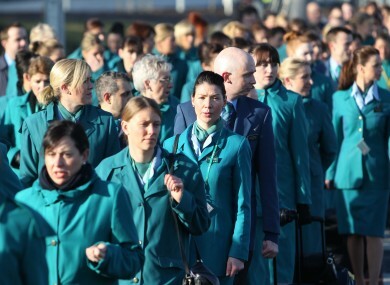 Staff have also expressed opposition to the closure of the Shannon cabin crew base, the union said yesterday. Niall Shanahan of IMPACT told TheJournal.ie that it is always the union’s position that “negotiation is better than the absence of meaningful engagement.” “This is a place where problems get solved”, Shanahan said. While Foley said that the LRC is “aware” of the separate dispute over rosters and breaches of agreements, he said that for now, the commission is “observing” the situation. Email “Aer Lingus and IMPACT to meet with LRC over Shannon job losses”. Feedback on “Aer Lingus and IMPACT to meet with LRC over Shannon job losses”.